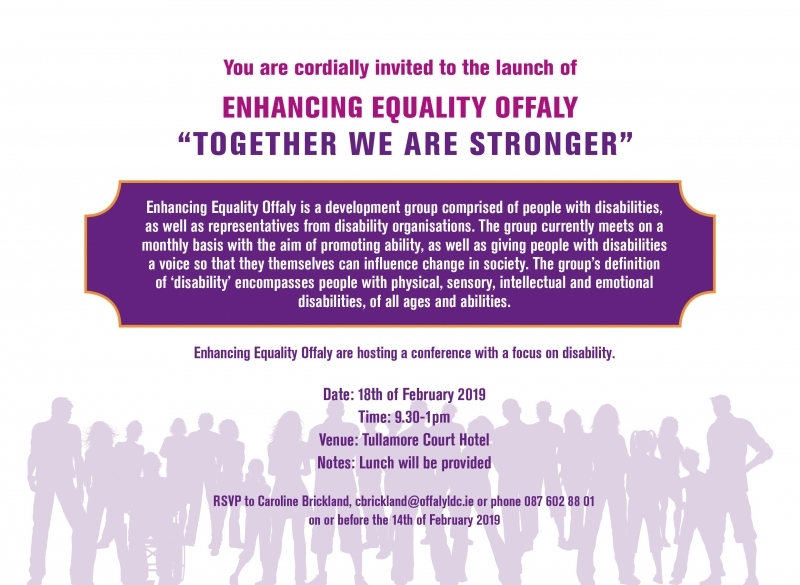 Home » Events » Enhancing Equality Offaly "Together We Are Stronger"
Enhancing Equality Offaly (EEO) are hosting a launch on the 18.02.2019 in The Tullamore Court Hotel from 9.30-1pm. Lunch is being provided on the day. We have many interesting speakers due to attend the launch that will focus on accessibility, inclusion and equality. Many of the speakers in attendance are influential people who have disabilities and have excelled at what they do. They will share aspects of their stories and speak about how everyone can play their part to respond to the needs of people with disabilities and to recognise the many positive contributions that this cohort make to society.